The charity now known as The Raptor Foundation was started in 1989 by Stewart and Liz McQuillan, following a chance encounter on a campsite in Norfolk in 1989. Stewart, a former R.A.F. engineer, and his wife Liz were on holiday on a campsite when another couple arrived with their two disabled Tawny owls. Liz and Stewart subsequently became members of a raptor rescue centre as active and enthusiastic fund-raisers. As their confidence and experience grew, the rescue centre asked Liz and Stewart to look after a disabled Tawny owl – enter Boris, a fledgling who had flown into a patio window and was blind in one eye. As word spread, other disabled raptors were brought to the McQuillan’s home in Ramsey for care and attention. Unfortunately when Stewart took the birds to be treated, he discovered that very few vets had any training or experience in working with raptors (although most of them were willing to learn) and the usual suggestion was that the bird should be put down. Stewart then discovered what became his bible – Veterinary Aspects of Captive Birds of Prey’ by John Cooper, an experienced vet and raptor enthusiast. About a year later, John Cooper, who lived locally, contacted the McQuillans and left his disabled raptors with them while he went to work in Africa. Before he went, he passed on some of his knowledge to the McQuillans and their volunteers, along with some research notes and information. In 1991, The Royal Veterinary Colleges in Glasgow, Edinburgh and London placed trainee vets at the centre to gain experience in treating raptors. About this time the number of raptors the McQuillans were looking after had risen to 130 birds and they moved to a house with a larger garden in Ramsey St. Marys. After 2 years the number of disabled raptors had grown into a full-time occupation and Ramsey Raptor Rescue was officially born as a registered charity and became the designated charity of the London Veterinary School. Again the numbers grew rapidly, especially with the charity accepting excess to requirement’ stock from breeders around the country. In other words, owlets were given a home and a chance of living in a sympathetic and caring environment. By 1995 the Ramsey St. Marys site was outgrown and Stewart and Liz started looking for a larger, purpose built site. There were many plans and disappointments before the present site became available. Even so the derelict farm, (which had been abandoned for 50 years) presented a challenge that took from September 1995 to October 1996 to be made inhabitable. The centre at Ramsey St. Marys was kept running for that year while the Somersham Road site was cleared enough to enable basic preparation ground work to be carried out. The opening timetable was delayed by vandalism to the site and the Great Flood in July 1996. However the raptors finally moved in to their new homes in August 1996. At the same time as the change of address the charity changed its name from Ramsey Raptor Rescue to The Raptor Foundation. It was no longer based in Ramsey and had evolved into a building site with a tearoom, craft shop, hospital and lots of mud. Various setbacks were overcome with the indispensable and willing volunteers. Hard work and determination have now produced better facilities for both residents and visitors – including the new millennium aviaries, an improved larger hospital with recovery rooms. The “Silent Wings Tea Shop” serves light lunches and cream teas and we also have our gift shop selling a wide range of souvenirs to remember your visit by. The new site has been designed to offer full disabled access to all the facilities, aviaries, hawk walk and the new flying display area. Such is the reputation of The Raptor Foundation today that it has received a visit from the Japanese Royal family and now plays host to vets from across the globe who come to take advantage of the experience and facilities available. From humble beginnings The Raptor Foundation has developed into a renowned establishment for the protection, treatment and rehabilitation of raptors. However, the foundation also affords thousands of visitors each year the opportunity to interact with and gain a greater understanding of these fascinating birds. 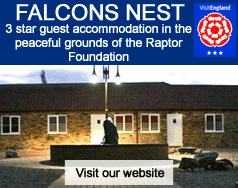 The Raptor Foundation has a philosophy of continuous improvement of facilities, both for the birds and for visitors. Projects currently in hand or nearing completion are detailed below. The building of further aviaries is an ongoing project that will provide accommodation that not only reflects the natural habitat of the birds in the wild but also offers a safe and stimulating environment. We are currently working on an education room which will give us an area to run courses in comfortable surroundings. It will serve as an area that could be used to give talks to schools and other groups. It could also be used by artists groups.The room will also house displays about birds of prey & falconry and we hope to have some computer-based interactive displays.